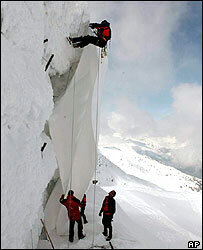 Workers at a Swiss ski resort have wrapped part of a retreating glacier in reflective sheeting to protect it, they say, from global warming. The Gurschen glacier, nearly 3,000m (10,000ft) above sea level, is melting like many others worldwide, with the worst damage done in summer. The thin protective layer of foil covers an area of 3-4,000 sq m (about 43,000 sq ft). Officials at the Gemsstock resort think others may follow their lead. "We think it will become common practice to cover parts of the glaciers," said Urs Elmiger of Andermatt Gotthard Sportbahnen, the cable car operator carrying out the project. The Gurschen glacier has sunk 20m (66 feet) in the last 15 years, making Andermatt's ski slopes very inaccessible. The protection was laid over a ramp of snow that is built up at the beginning of each season but then melts again each summer. "It needs a lot of work, energy and money to rebuild. And one day, if the melt increases, the cost of rebuilding the ramp will be very, very high," Mr Elmiger said. Scientists said that while the technique might help preserve snow cover in small areas, it would not address the problem of vanishing ice fields around the world. "It may be useful very locally, but it would be totally unfeasible - economically and ecologically - to cover completely even a small glacier," geography Professor Wilfried Haeberli, of the University of Zurich, told Reuters. Researchers at the university say 70% of Switzerland's glaciers will disappear in the next 30 years, due to the effects of global warming. Environmental groups protested as the glacier was covered, saying a fundamental change in climate policy - not short-term measures - was required. Martin Hiller, of the WWF International group, said: "The solution is to switch to clean energy; we need to cut down on harmful pollutants, such as CO2."